Setting up new accounting and business management software is no easy task. The process can be quite overwhelming to someone who has little or no experience with the software and how to implement it. When considering Sage 100 ERP (formerly MAS 90 and MAS 200) it is highly recommended you choose a company that offers support throughout all phases of implementation, from purchase to deployment and beyond. The experts at The LLB Group can help you get the most out of your investment in Sage 100 ERP software and improve the efficiency of your business processes. The LLB Group, LLC is an authorized partner, reseller and master developer of Sage 100 ERP, an award winning accounting and business management software solution for small to mid-sized companies. Design and Planning - At The LLB Group, we focus on Sage 100 ERP design and planning. This includes customization of the software to fit your business needs. Sage 100 ERP offers a wide variety of feature-rich solutions including core accounting and finance, business intelligence, customer relationship management, eBusiness, HR and payroll, manufacturing, distribution innovative customization, and low total cost of ownership. A Sage consultant from The LLB Group can help you determine what features will work best and how they can increase uptime, productivity and promote better customer information management. Implementation and Training - Our team specializes in implementing Sage 100 ERP. In hiring us, your implementation goes off without a hitch and your staff are trained in all aspects of the software. Post-launch - After the launch of your Sage software, The LLB Group continues to provide support to help complete the transition. If there are any strategies or services that must be changed or upgraded, we can help. Support and Maintenance - The experts at The LLB Group will do much more than designing and deploying your Sage solution. We provide expert advice on running Sage ERP 100, helping you, and providing support every step of the way, even after the sale! Sage 100 ERP contains the power and tools to help you see your business in a new way so you can improve productivity, envision success, and accelerate growth. 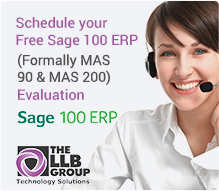 Contact us to learn more about what Sage 100 ERP can do for you.